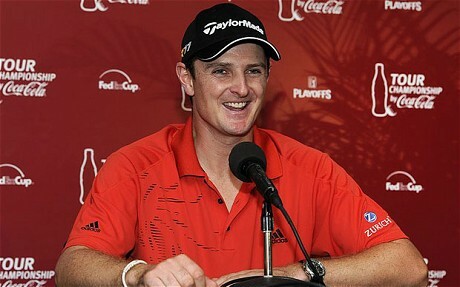 Justin Rose was faultlessly diplomatic in claiming that money would not be a distraction at the start of the Tour Championship in Atlanta on Thursday. But even he could not dispute the size of the windfall on offer if he seals a second straight PGA Tour title on Sunday night â€” one that would guarantee he became the first British winner of the FedEx Cup. Glowing in the wake of his victory in last weekâ€™s BMW Championship in Illinois, elevating him to third in the FedEx standings, Rose is on the cusp of securing a $10million (Â£6.4million) bonus cheque. Prodigiously wealthy already, owning homes in Florida and the Bahamas, Rose ought not to worry unduly. The 31 year-old spoke with the ease of one who, until his triumph at the BMW, had not even been in contention to be in the top 30 competing at East Lake this week, and he insisted he felt no burden of expectation. Chasing him hard for the FedEx riches is Luke Donald, a player who could yet finish top of both the American and European money lists. In the European Tourâ€™s Race to Dubai, he is more than Â£1million clear of nearest challenger Rory McIlroy and appears all but unassailable. As with Rose, though, he must win at East Lake to ensure that he secures the FedEx Cup, in which he finished runner-up to Jim Furyk 12 months ago. One also in clover on Wednesday was McIlroy, who cashed in on his growing popularity by signing a multiyear sponsorship deal with Spanish bank Santander. McIlroy joins F1 drivers Lewis Hamilton and Jenson Button at the forefront of the bankâ€™s UK advertising. The deal is understood to be worth seven figures with bonuses.